Australia continues to blindly court local and multinational mining companies with one of the largest untapped thermal coal deposits in the world, despite the global pipeline of new coal-fired power plants continuing to shrink and global warming becoming blatantly obvious due to extreme record-breaking weather events. Beneath the Galilee Basin in Central Queensland, Australia, is a 500 km-long measure of low energy, high ash coal which six mining entities want to get their hands on, including Adani’s proposed Carmichael mine, the Chinese Meijin Energy Group MacMines’ China Stone, Hancock Prospecting’s Alpha, Alpha West and Kevin’s Corner, the South Galilee Coal Project (SGCP), Australian businessman Clive Palmer’s long delayed China First, and Resolve Coal’s Hyde Park proposal. An Australian government politician, the Greens Senator for Queensland, Larissa Waters introduced a bill to Parliament on 5 December 2018 prohibiting any thermal coal development of the Galilee Basin, prior to mining licences being issued (Adani has been issued a mining lease although it is the only one). Currently open for consultation, IEEFA notes the Galilee Basin (Coal Prohibition) Bill 2018 is consistent with global coal forecasts, the shrinkage of the global pipeline, and the movement of global financial institutions away from thermal coal. GLOBAL FORECASTERS HAVE PREDICTED THE SEABORNE THERMAL COAL MARKET WILL SHRINK BY MORE THAN HALF within two decades if countries, corporates and financiers around the world collectively act on the Paris Agreement. 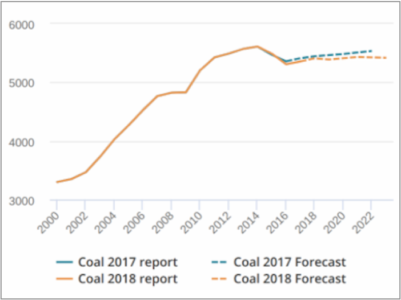 Modelling a stagnant outlook for coal to 2022, the International Energy Agency (IEA) acknowledges global coal use likely peaked in 2014 (Figure 1), reflected in Australia where thermal coal exports peaked in 2016 and are now likely in a long term and ultimately terminal decline. IEEFA notes the global seaborne thermal coal market is not likely to reverse the inevitable technology, finance, cost and policy-driven direction of a slow and ultimately terminal decline in coal volumes. The technology disruption of global electricity markets is well entrenched and unstoppable. The global market is now pricing low energy, high ash thermal coal exports at an unprecedented discount compared to Newcastle’s – the world’s largest export port in Australia – benchmark for higher energy content thermal coal. During 2018 the price differential between high energy 6,000kcal coal and the lower energy coal reached a record high. 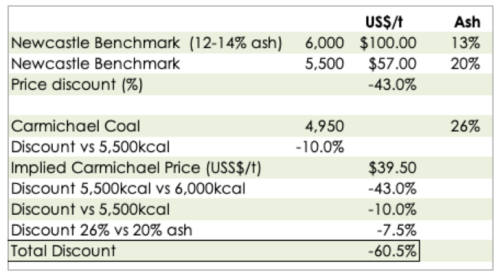 In Australia, the Newcastle benchmark for 5,500kcal coal with 20% ash declined over 2018 and exited the year at just US$57/t. Australia has historically produced high energy, low ash coal from existing regions, and this remains in strong demand. Critically, at the other end of the spectrum is the low energy, high ash coal in the Galilee Basin which is inferior to the Australian / Indonesian / South African / Columbian export market average. This polarity is a key reason not to develop the low-grade resource in the Galilee Basin. Mining operators at the Galilee Basin could wash the raw coal, marginally reducing the ash content and boosting the energy content, but this would significantly increase production costs and would be subject to seasonal variations including water availability. Of concern to the drought-stricken Queensland community are the severe water draw-down risks posed by the cumulative impact of multiple, huge coal mining plans for the Galilee Basin. The Adani Group alone wants to extract up to 12.5-billion-litres per year to 2077 from the Galilee Basin’s Belyando River for use at their proposed Carmichael mine, with the maximum total water potentially doubling this amount when coal “dewatering” is included. THERE ARE ALSO MASSIVE FINANCIAL RISKS FROM OPENING AN ENTIRELY NEW COAL BASIN. The high stranded asset risk associated with the Galilee Basin’s remote location combined with the low energy of coal and the need to develop dedicated rail, port, power and road infrastructure stands in stark contrast to the high-energy coal found in other Australian coal basins already in production in close proximity to ports. The inability to find global financial sector support for the Galilee Basin’s investment proposals stems from the rapid cost declines of renewable energy technology and the very clear message of the UN Intergovernmental Panel on Climate Change (IPCC) highlighting the need for countries to virtually cease global coal use by 2050. There is also an ongoing and accelerating global shift away from financing thermal coal and coal-fired power plants. Australian banks have all made strong commitments to reduce funding for thermal coal mining and coal fired power plants, recognising the global financial risks of climate change. Even China has ruled out funding Adani’s Carmichael mine proposal. Indeed, the progressive global coal-fired power divestment announcements during 2018 were nothing short of staggering. New thermal coal exits were announced by Japan’s (Australia’s largest thermal coal export destination) Dai-ichi Life and Nippon Life. Japanese banks also changed their policies to exclude all lending to out-dated coal-fired power plant technologies, while nine proposed new coal-fired power units have cancelled since 2012, including a 2,000 megawatt plant last week. South Korea’s investment in new thermal coal mines also shifted dramatically with the government committing to reduce reliance on thermal coal while progressively decarbonising the economy. GLOBALLY, EIGHTEEN MAJOR BANKS DIVESTED FROM COAL IN 2018 ALONE, including Standard Chartered, Generali of Italy, HSBC, Hannover Re, Swiss Re, Munich Re, Barclays Bank UK, Export Development Canada and ING (to name a few), highlighting the urgency in which global financial institutions are pivoting away from coal and boosting lending to cheaper renewables and other low emissions alternatives. Opening a new, low energy thermal coal basin is clearly moving diametrically in the opposite direction to Australia’s Paris commitments, global thermal coal forecasts, and banks and insurer divestment trends. 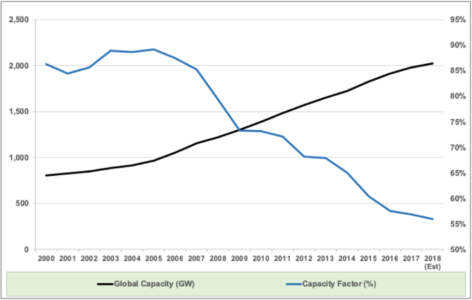 Rather than sinking more capital into expanding thermal coal supply even as demand declines, Australia should better optimise existing ventures while investing in new low emissions renewable industries of the future, to best transition the Australian economy and limit our collective exposure to stranded assets. Any capital development in the Galilee Basin is likely to elevate water risks for local communities, become a stranded asset and create significant financial risks for Australia. Absent a detailed, independent cumulative impact analysis showing the consequences of developing up to 300Mtpa of new thermal coal mines in the Galilee Basin, this isolated, marginal coal basin should remain untapped. Read our full submission to the Australian Parliament here: Galilee Basin (Coal Prohibition) Bill 2018.